The ballista was the ultimate artillery weapon of the Roman Empire. Similar in appearance to a giant crossbow, it was powered by massive bundles of twisted horse hair. The bolts it fires would mow down enemies and fortifications alike. This kit is based on the Roman design. It is laser cut from select hardwood for easy assembly and reliable performance. This tabletop kit has been designed for simple assembly. 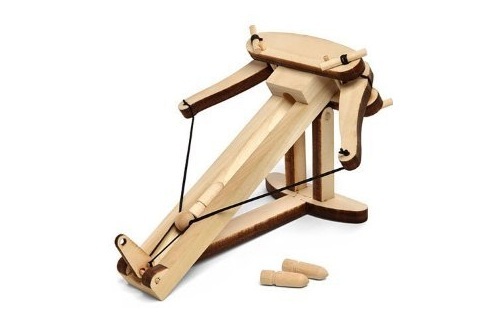 Designed with interlocking parts, a simple, reliable trigger, high strength cordage and lightweight projectiles this ballista is incredibly durable. Three easy-to-follow rules for public demonstration are provided to ensure everyone's safety. Price: $15.60 & eligible for FREE Super Saver Shipping on orders over $25.